Whether on its own or combined with brick or other materials, white stone makes a statement. When putting together white stone exterior color schemes you can choose contrasting colors or let the texture take the lead with a tonal scheme. Here are some ideas to get you started. White limestone and brick are a perfect pairing. White trim carries the color around the entire exterior and a maroon keeps the door from being lost between the eye-catching brick and stone. Adding color to your roof works very well with a palette of neutrals or muted colors. 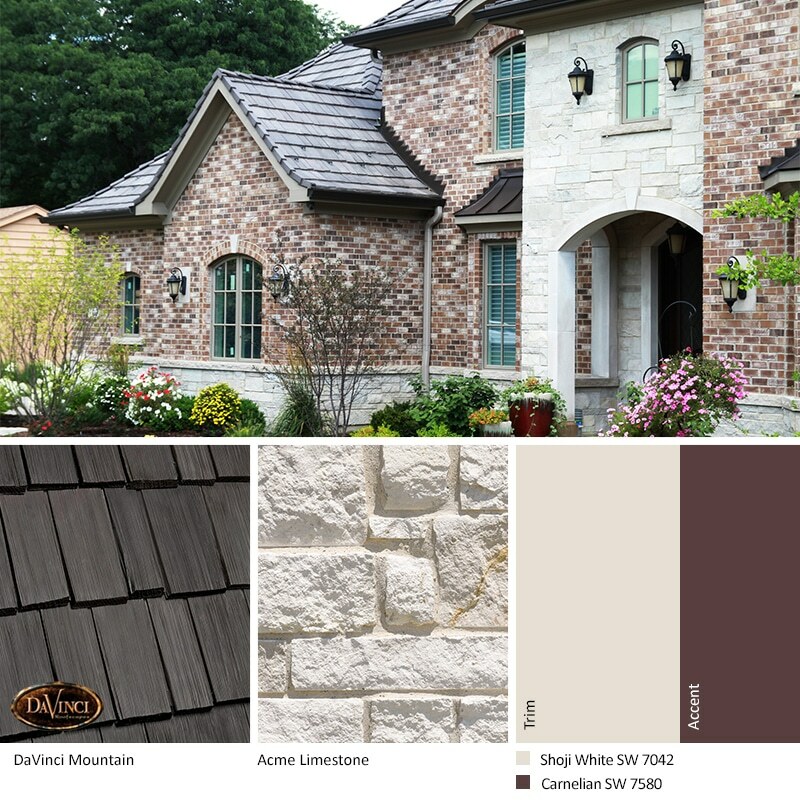 A roof blend like Weathered Green is a colorful counterpoint to white stone and taupe paint. Create a scheme that is as inviting as your stone’s namesake. Cashmere offers cool gray and white. Keep the look tranquil with light and airy blue-gray accents. Play up the soft tones in your white stone with white with the same undertones as your main color. Go with a shade of rose on the door and gray with a touch of violet on the shutters to complete the look. An advantage of stone is that it draws attention and needs little more than a great roof and accent color to set it off. Grab some of the spotlight for yourself by adding a front door color that reflects your personality. Use the tips above to inspire you as you create a color palette to complement your stone. Then for even more helpful information, download our complete guide to select pink brick exterior color schemes – FRESH Home Exterior Color Schemes for Brick and Stone.